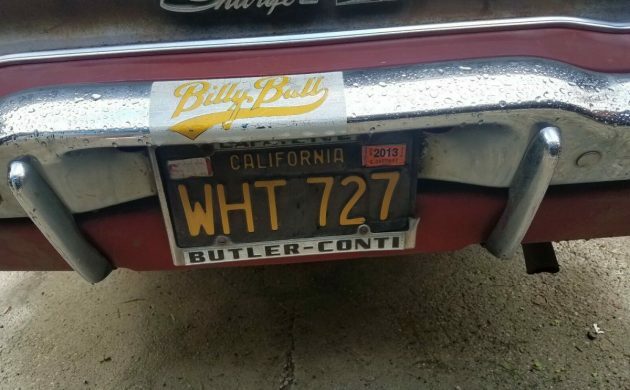 It appears that this 1968 Charger has spent the majority of its life in California and it is still wearing its original black plates. That California climate has certainly done its usual fine job of preserving the car. 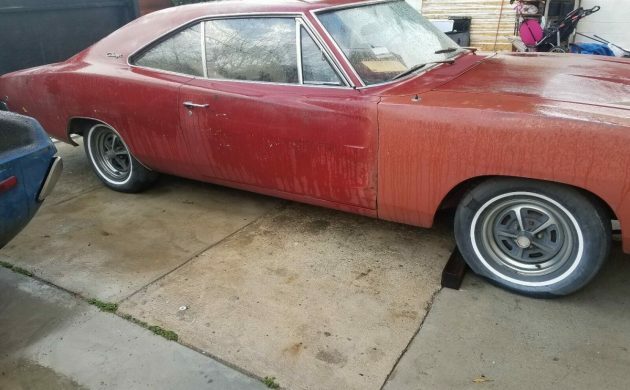 The Charger will need restoration, but it shows a lot of promise. Located in Granada Hills, California, you will find the Charger listed for sale here on eBay. The owner states that the majority of the car wears its original paint and that it is rust free. He also provides plenty of photos of the underside of the car, and apart from a dusting of surface corrosion, it looks to be really solid. The quarter glass on the driver’s side is not fitted to the car, but it is present. The owner does say that the interior will require restoration, but there are some good, original features that are present. The gauges look to be complete and in good condition. The front seats as fitted to the car aren’t original, but the originals are included with the vehicle. Apparently, there is also a set of new door trims which are still in their boxes, and these are included as well. The owner refers to this Charger as a base model, and as a result, it is fitted with the 318ci V8 engine, and a 3-speed manual transmission with column shift. The owner is pretty open about the mileage. He says that he was told by the previous owner that the indicated 45,800 miles are original, but he has no way of confirming this. 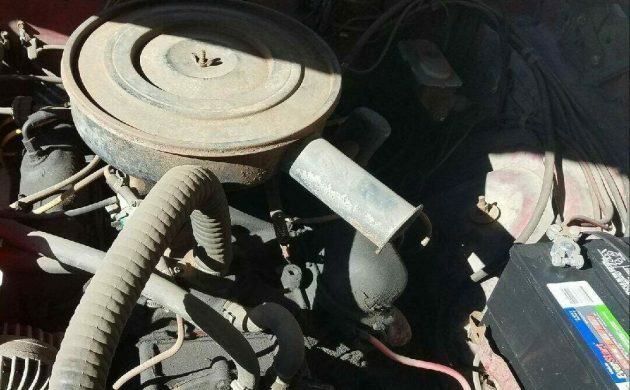 Anyhow, the car runs and drives, although the owner does suggest that the brakes will require some work, as the car has a low pedal. So, now we get to the business end of proceedings, and that’s the price. The owner has set a BIN price of $28,000 for the Charger, but the option is there to make an offer. Is this too steep for this car? It’s possible that the 53 people watching the auction think that the price seems reasonable. Give me the 69 RR recently featured after this one….any day. Not even any rust around the rear window… this is a VERY solid car. And a Charger with a 3 speed on the column? I would have guessed no such car was ever built. This is a real find as-is. 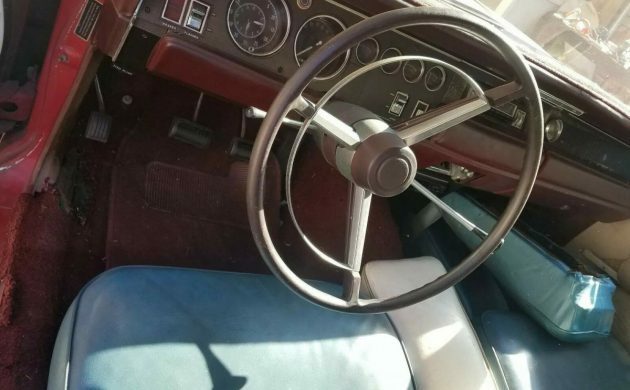 Speaking of that – would a floor shift conversion, and a 5 speed be the ticket? Now I have to research this. 318 can stay, find some 34O heads and a 4 bbl intake. Or, FI since it has a modern five speed. My parents had a ’77 Dodge van, 318, 3-speed column shift, in this approximate color. This is much cooler. I’d love to have this. As far as I know, a 318 doesn’t make near the power that a 340 does, but I’ve heard that heads and a cam will wake it up. And I’d be tempted to convert it to a 4-speed and floor-shift. I, being a fan of these cars anyhow, would restore it to original. I love the 3 on the tree just for the fact that it is an oddity. Combine that with the fact that it is bolted onto the back of a 318, which is a great engine itself, plus the body is original red, I see nothing to change. Growing up in the 1980’s as my high school years, I used to see these thing all around as clapped out beaters. I believe it was an unwritten law that they all had to have rear spring shackles to jack them up & some sort of aluminum slot or Crager rim. I would run black Steelies & puppy pans. The addition of the split bucket seats with the “buddy seat” in the middle is a decent idea for long drives (armrest). I wish I weren’t so financially strapped. I would be bidding on it, even @ this price. The age curve on these any many more in this/these year ranges are going to tank with morbid rates…it is what it is. This car might get far more looks and attention at a car show than the countless beautiful R/T’s that are parked near it. Yes! That is the best answer! 318, 3 spd, bench, ‘buddy’ seat in white, bright red outside, shallow rally wheels (for the 4 wheel drums, I assume? ), and this WOULD be the Belle of the ball, show, cruise night, etc. Keep the black plates, too. Stayed after a original owner 1968 with base 225 6cyl and 3 on the tree…rare but they wouldn’t sell it…one day it was gone. Rare – last year of the all chrome 5 1/2 inch wide road wheels – some even carried the penastar stamp on them. Nice classic here,always liked the taillights on the ‘68! These are desirable cars bringing a little more money every time one appears for sale! As I have said before a 318 can be built into a real performance engine. Bore and stroke to somewhere between 360 and 400 cu. in. It has been many years since i read article. Dont know if 340 heads would work 360 heads work. The police pursuit 318 used 360 heads. Price on this charger is way to high for work needed and no 383 at least. Just my opinion on price. Great ideas, take a unique car, maybe the only one like it, spend money to make it just like 80% of the rest of them. Production of 318, 3-speed stick says none made. Since production figures are done by percent, it is possible so few made as to not show up. Just a thought. Assuming its possible, a special order, I want it only this way, customer, had to have it. Money speaks when these situations come up. So, my figures show all 318 cars were auto trans. Example, I know of 2 slant 6 68 Chargers with a 3 speed stick. But, says none produced. 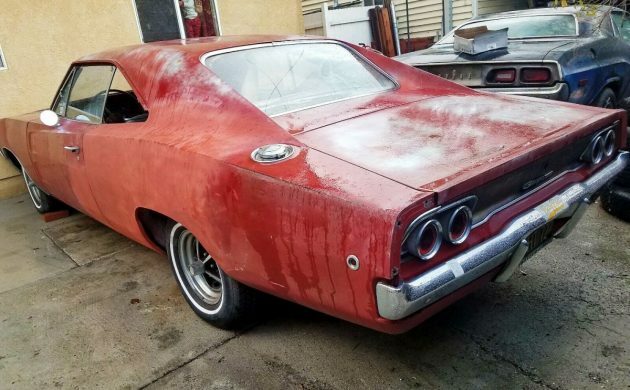 There were for sure more than a handful of 318 3spd Chargers made in ‘68. My dad ordered one new. His was white with a red interior and it had factory A/C. If you go on the Dodge Charger forum there are a few threads dedicated to 3spd. , column shifted manual cars. They’re rare but out there. I spoke to the guy who runs (or used to) The Dodge Charger registry and he actually had my dad’s Cars vin # in his data base.